Marin Sangha is a mindfulness meditation (vipassana) group in Marin County that puts special emphasis on living the dharma in daily life. The evening's agenda includes guided meditations, mindful movement or walking meditation, and insightful talks that draw upon various aspects of the Buddha's teachings. Our principal guiding teachers are Donald Rothberg and Oren J. Sofer, but we also host teachers of diverse backgrounds and disciplines including nuns and monks from the Northern California monastic communities. Sangha means "community". Since our inception in 1998, Marin Sangha has been committed to creating a safe and welcoming community where dharma students can come and explore how Buddhist teachings might unfold in their everyday lives. We invite students of all levels of meditation experience and beginners are especially welcome. We provide chairs, all you might need is a comfy cushion. This venue is wheelchair accessible. 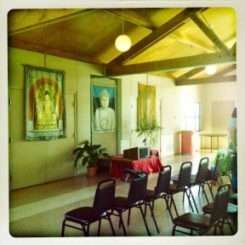 In the Buddhist tradition, the teachings are given freely because they are considered priceless; That means there's no fee for attending our weekly meeting. Instead, we practice dana, or generosity. Dana isn't payment for goods or services but an expression of gratitude. We offer dana to our teachers since many of them have no other means of support, and use it to pay for our rent, insurance, and other maintenance costs. Another way to practice dana is through service. Significant efforts goes into ensuring that each meeting goes smoothly. Sangha members are encouraged to volunteer to help set up before the meeting and straighten up afterwards. Whether you want to help on a regular or occasional basis is entirely up to you -- it's a great opportunity to make friends and build on your dharma practice. The third Sunday of each month is a time for socializing. We show up early, and many of us bring vegetarian snacks to share. Please consider making a donation to Marin Sangha to aid us in our mission of helping individuals live a values-based spiritual life in alignment with Buddhist principles. Donations are tax-deductable.